Type of Room: AC Twin Sharing Room With Attached Bathroom, Free WiFi. Cupboard, Study Table, Books Cabinet, Automatic Washing Machine. Non AC Accommodation INR 7000 per month. Air Conditioned AC Accommodation INR 8500 per month. 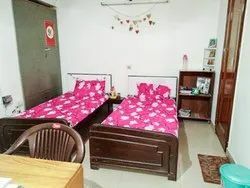 PG West Delhi is a renowned women hostel in Delhi providing affordable accommodation for women and girls working in Delhi. Located in the Hari Nagar area of West Delhi, this women hostel is known for world-class amenities and affordable cost. If you are looking for "Paying Guest in Gurgaon for Boys", then you are at the right place. We are one of the best providers of Paying Guest accommodation in Gurgaon. Check one of our Gurgaon property for paying guest for boys. Designed to meet the accommodation requirements of our valuable guests, tourists and families, our AC rooms are luxury personified. We have a wide array of options to choose from in AC rooms. Our rooms comprise deluxe (single occupancy), super deluxe suite room and more meeting the different budgetary limit. Excellent paying guest accommodation in the Posh East Of Kailash area. Recently built, well furnished Ultra Spacious Rooms. We offer a clean living space to working boys or students in a quiet and safe Karol Bagh New Delhi. Room available on a single / twin sharing basis. Nearest metro station, Karol Bagh 10-15 minute rickshaw ride. Food served is of mixed cuisine to help candidates to get accustomed to various types of food preparations. The diet is balanced and the food is wholesome. The Executive Rooms at Hotel Arpit Palace stand to be the vanguard in respect to design and facilities. Designated to keep up to the demands of contemporary business traveller, these rooms are voguish, ergonomically appointed and tastefully embellished with the sole aim of being a perfect business suite. Rockwell is ideally located in the heart of the Capital City, at the City Center Ajamal, Karolbag, New Delhi. We offer offer unmatched luxury and comfort to business travelers and tourists from India and abroad. We promise a perfect holiday and look forward to serve and make your stay comfortable and most enjoyable. A fully furnished Paying Guest Facility has homely atmosphere, available with food and without food & at a prime location, at a very reasonable and affordable price.